PM934 Tinted Flap. Part Number: PM934 (Replaces PM905). Spare Door Flap For 12011/12012/10999/9611/21936/21937/219. 905 Spare Flap (tinted) for 204/209. Spare Door Flap For 4470. 913 Spare Flap (tinted) for 221. Catmate Door 2 Spare Magnets. 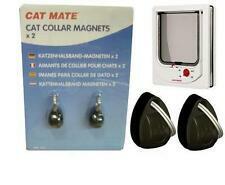 Box Contains Cat collar magnets 2pcs. Including 2 collar magnets. Catmate Door 2 Spare Magnets. Including 2 collar magnets. Product Safety. This product is subject to specific safety warnings. Safety Warning. Warning: Not suitable for children under 3 years. For use under adult supervision. Catmate Door 2 Spare Magnets. Including 2 collar magnets. Pet Type Cat. If there's a problem, just let us know and we will fix it. Size One Size. For simple fitting in wooden doors and panels up to 60 mm thick. Including 2 collar magnets. Pet Type: Cat. Size: One Size. Closure: Belted. Why Buy From BirdOnAWire?. Date First Available: 9 April 2008. Batteries Included: No. Batteries Required: No. Fancy a free cat toy?. Fish Ball Cat Pouncer Toy. 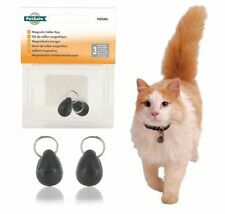 Free gift when you spend over £25 on any cat products! Subject to change and availability. help based in the UK. Product Code: 9936. RRP: £2.99.